In each issue of Paprika Southern we feature three creatives living and working in the South in our Creative South section. This section is dedicated to highlighting both emerging and established makers, artists, and entrepreneurs who are doing innovative and exciting things in the South. This article about the creator of Daughter Handwovens, Alexandra Forby, was originally published in the print edition of Paprika Southern Spring 2018. To see the article in print, along with an exploration of the photographic legacy of southern photographer Jack Leigh, our tips on how to begin a lifelong art collection, a spring brunch menu with recipes, and much more, order a back issue of the Spring 2018 issue of Paprika Southern. In Alexandra Forby’s Savannah studio, strands of cotton and linen are woven together in intricate patterns to form throw pillows, tea towels, and other handwoven goods. The sound of the 36-inch, four-shaft loom that Alexandra operates resounds in organized cacophony and the process is surprisingly physical. Weaving is an ancient art, and Alexandra, owner of Daughter Handwovens, loves the tradition it represents. Proverbs 31 also serves as the inspiration for the name of her business. 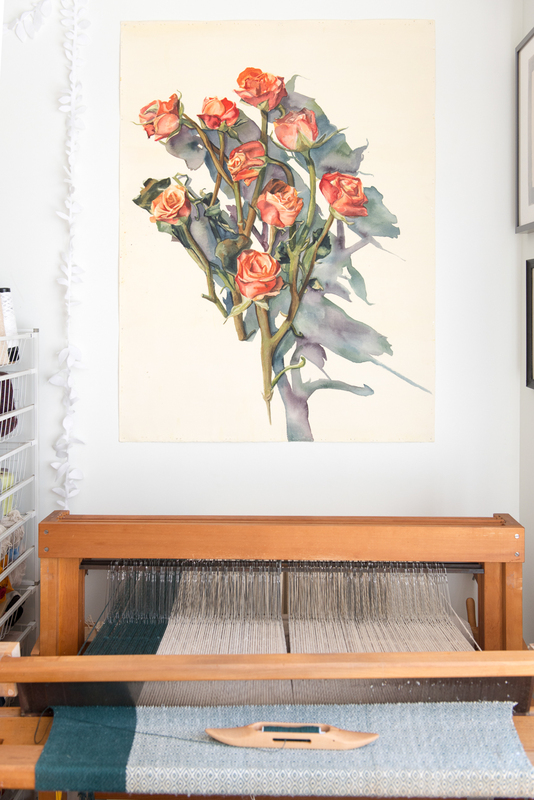 After graduating from Savannah College of Art and Design in 2013 with a BFA in painting, Alexandra, who had always dabbled in fibers art, eventually found her way to weaving, starting Daughter Handwovens in 2016. Though the business is young her work has been well-received at craft fairs and on Etsy, and over the 2017 holiday season she sold every scarf she made. The hand-weaving process requires patience. It takes two days to set up the loom for a project. Though she can do multiple pieces once the loom is set up, a scarf, for example, takes about four hours to weave. The ancient nature of weaving, as well as its tradition as a women’s craft, both appeal to Alexandra. “I’ve always loved the idea of passing down useful things, like textiles, and how textiles really capture the feeling of the era. Earthy, muted tones are a signature of Daughter Handwovens, and Alexandra positions her products as heirloom-quality goods. While the aesthetic of pieces reflects current trends, these handmade products are part of a long legacy. Alexandra relates a story of being asked by a Viking re-enactor to create authentic Viking belts. To fulfill the commission she researched patterns appropriate to the era and taught herself to weave using weaving cards, tools that would have been made of stone or wood in ancient times. The current popularity of the handmade marketplace has been a boon to Alexandra’s business, allowing her to price her work according to its value. “The world today is more appreciative of handmade goods,” she says. The potential for self-sufficiency of weaving is also important to Daughter Handwovens. Alexandra works primarily with cotton and linen, both plant-based fibers, which allows her work to be vegan-friendly and free of allergens. She is teaching herself to spin her own cotton, and eventually wants to dye the fibers herself, with the goal of taking cotton from the plant to the finished product, allowing them to be completely sustainable.